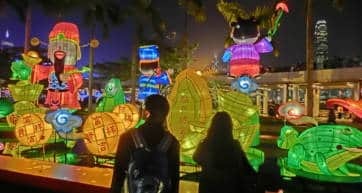 Tsim Sha Tsui—abbreviated by literally everyone to TST—is your starting point for exploring the Kowloon peninsula, though there is a lot to see in TST itself, including all the best museums, a stunning waterfront promenade, historic sites and buildings, and loads of shopping and entertainment. It’s also home to the Kowloon side of the Star Ferry Terminal, and crossing Victoria Harbour by Star Ferry is a quintessential Hong Kong experience. There’s a lot to see around the waterfront, so get your cameras out and take a stroll around this picturesque area. 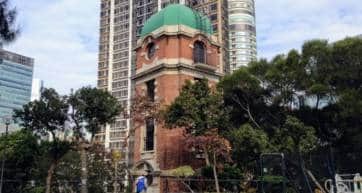 You’ll first notice the Clock Tower, a landmark since 1915 and the only remaining structure from the original Kowloon-Canton Railway. Behind this is the Hong Kong Cultural Centre, which hosts a variety of world-class performances and exhibitions year-round. 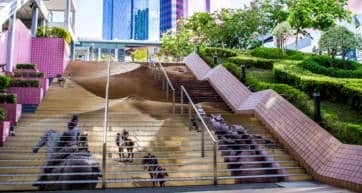 Next to the tower is a set of stairs leading to the Tsim Sha Tsui Promenade, a long stretch along the harbour with fabulous views of Hong Kong Island. This is where you’ll want to be at 8pm for the nightly Symphony of Lights, a 10-minute laser light show that highlights the most iconic buildings along the skyline. A great way to watch the show is to board the Aqua Luna, one of the last traditional wooden Chinese junk boats plying the harbour, and you can’t miss its red sails billowing in the wind. Further down the Promenade is the Avenue of Stars, where tourists love to snap a picture with the statue of Bruce Lee, and find plaques and hand prints of other famous Hong Kong film stars. But the star of the waterfront remains the Star Ferry itself, where the little green boats have puttered their way between ‘Kowloon side’ and ‘Island side’ since 1888, making it the oldest form of public transport in Hong Kong. Though you can easily be whisked from Tsim Sha Tsui to Central by the MTR in mere seconds, the Star Ferry is a must-do, as it lets you enjoy the leisurely trip with a million-dollar view. The Hong Kong Museum of Art and the Hong Kong Space Museum are the ones closest to the Star Ferry Terminal. 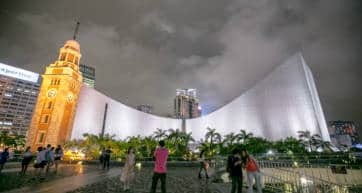 But the two that really stand out, and happen to be right next to each other, are the Hong Kong Museum of History and the Hong Kong Museum of Science. 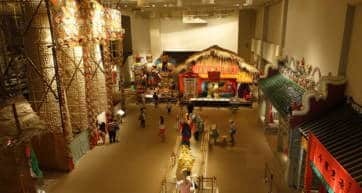 These are definitely good indoor activities for a rainy day. Nathan Road is the main strip that runs from south to north in Kowloon and is nicknamed ‘The Golden Mile’. Here you’ll find lots and lots of shopping at high-end brand name stores that actually have people queuing up to get inside like a nightclub. Another major shopping area is Canton Road, with more flagship stores, and lots of restaurants to choose from. 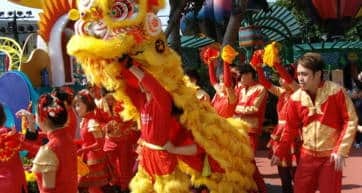 To see some local culture, visit Kowloon Park, where every Sunday you can visit ‘Kung Fu Corner’ to see tai chi demonstrations and traditional lion dances. If you for some reason have an urge to destroy something during a meal, you’re in luck – at Peking Garden in TST, they even give you the hammer. On the menu at this famous restaurant is a dish called ‘Beggar’s Chicken’, which must be reserved in advance. The chicken is wrapped in lotus leaves and then baked in clay, which you get to whack open with a golden hammer. Another top dish is Peking duck, thinly sliced, succulent, and worth the price tag. Another great experience is to attend High Tea at the Peninsula Hotel, which opened its doors in 1928 and is a landmark of the area. High tea is on a first-come-first served basis, and is popular with tourists. For a twist on traditional dim sum, get your Instagram fix at Yum Cha, where dumplings and buns come in kawaii animal shapes that are almost too cute to eat. Dim Sum Icon also serves up cute buns in a basket, and changes their characters every three months. The notorious Chungking Mansions is full of cheap guesthouses and curry restaurants, with food from India, Nepal, Pakistan and Sri Lanka, so if you’re looking for a little spice then simply wander the corridors and peek inside the eateries before deciding, but use your discretion. A lovely little area to enjoy alfresco dining is Knutsford Terrace, where a strip of restaurants and bars set up tables outside and have a lively atmosphere. You can choose from world cuisines such as Mexican, Korean, European, and Japanese, and even find shisha and belly dancing. No night in Tsim Sha Tsui would be complete without a cocktail at one of the many high-rise bars, so dress to impress before joining the beautiful people at Aqua or Hutong, both located at One Peking Road. Felix at the Peninsula Hotel is another crowd-pleaser and known for its ‘loo with a view’—even the bathrooms have full harbour views from the 28th floor. Eyebar in iSquare mall has a fabulous outdoor terrace with panoramic views of the city where you can enjoy ‘sunset hour’ cocktails. Technically not in TST but a very close taxi ride is the International Commerce Centre, home to the highest bar in the world, Ozone. Your ears will pop in the elevator as you ascend an unbelievable 118 floors, with the whole of Hong Kong literally at your feet. 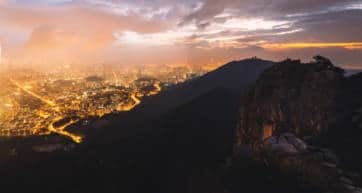 Kowloon is the hotel mecca of Hong Kong, with everything from backpacker hostels to 5-star harbourfront hotels, but be aware that even the low-end hotels can set you back HK$400.00 to HK$500.00 a night. High-end hotels can be as much as HK$5,500.00 a night and up. Airbnb is a good option to stay in Tsim Sha Tsui. A lot of hotels cluster around Nathan Road, with the cheapest (and usually dodgiest) hostels and guest houses located inside Chungking Mansions and Mirador Mansions, though single female travellers should exercise caution. If you’re on a tight budget you can expect really tiny rooms and dormitories in an old building, but Just Hotel and Urban Pack Hostel are both nicely renovated and modern on the inside. In the mid range, Hotel Panorama is very reasonably priced and has a lovely outdoor terrace. 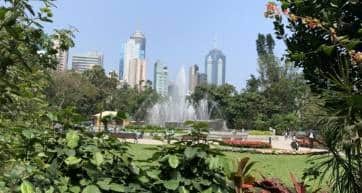 Acesite Knutsford Hotel and The Bauhinia, which are across from each other, are well located and close to lots of entertainment. One of the best locations, however, is the Salisbury YMCA, in the heart of the city, walking distance to absolutely everything, and has a pool. For something more upscale, The Peninsula, the InterContinental, and the Langham are all landmark hotels, though it will cost a pretty penny. Can’t afford it? Join the club.